The Flagler County School Board this evening at its meeting recognizes Flagler Palm Coast High School’s John Seth, who was honored in December as one of “50 Directors Who Make a Difference” nationally by School Band and Orchestra Magazine. This is the 19th year the magazine has highlighted music educators from each state. Current and former students, colleagues and parents submitted nominations. Seth has taught for 13 years, nine of them at FPC. 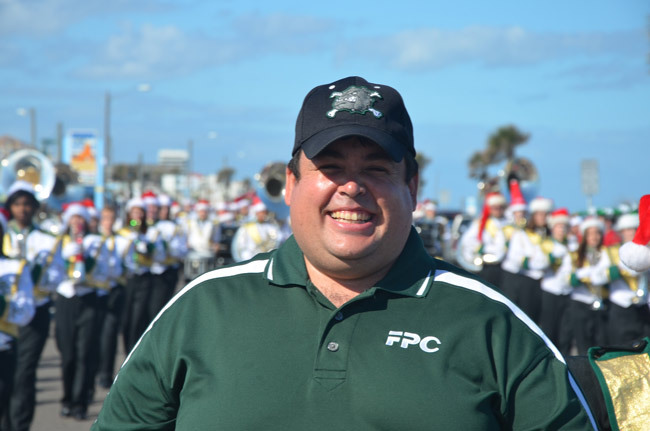 He was named the Teacher of the Year for FPC in 2014. Just last year, Seth was presented with the Shine Award by Florida Governor Rick Scott. The award goes to educators and school administrators who make significant contributions to education. Today: Partly cloudy. Areas of dense fog in the morning. Highs in the lower 80s inland, in the upper 70s coast. Southeast winds 5 to 10 mph. Tonight: Partly cloudy. Areas of fog after midnight. Lows in the upper 50s. Southeast winds 5 mph shifting to the southwest after midnight.Details here. Drought Index is at 370. The OED’s Word of the Day: peaceable kingdom, n.. 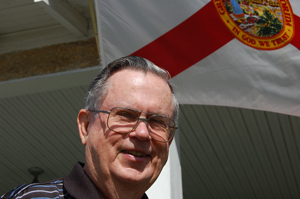 The Palm Coast City Council meets at 9 a.m. at City Hall in Town Center. The council will donate proceeds from the latest Pink Army event, raising money for breast-cancer awareness, to the Florida Hospital Flagler Foundation Cancer Fund. The council is expected to approve financing a set of existing loans at better terms, and to approve a contract for $7.8 million to start construction at the Palm Coast Community Center in February. The Flagler County School Board meets for a rezoning workshop at 4 p.m. in Training Room 3 on the third floor of the Government Services Building, then at 5 p.m. for a workshop followed by its regular meeting at 6 p.m. in board chambers at the Government Services Building, Bunnell. Watch out: the 6 p.m. meeting’s agenda has a new format, more complicated to navigate than its predecessors. At the 5 p.m. workshop, board members will hear a proposals from a private company called LoansAtWork to provide emergency loans to school employees. See that presentation here. At the 6 p.m. meeting, the board will recognize John Seth, who was named one of 50 music directors who made a difference by a national band magazine in December (see the photo caption above). The Bunnell Planning Board meets at 7 p.m. at Bunnell City Hall, 201 West Moody Boulevard. The board will hear a request for site plan approval for the expansion of the Flagler Playhouse at 301 E. Moody Blvd. See the proposal here. The planning board is chaired by Thea Mathen. 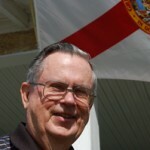 Learn about historic and interesting Flagler County sites with local author Bill Ryan as your guide on this latest Historic Flagler County Bus Tour. The bus leaves at 10 a.m. from the Holden House, 204 East Moody Boulevard, Bunnell, and returns at 2:30 p.m. The cost is $20, which does not include lunch at Bull Creek Fish Camp. To make reservations or for more information call 386-439-5003. The Flagler County Centennial Committee meets at 1:30 p.m. in the Executive Conference Room of the Emergency Operations Center in Bunnell. ♦ Jan. 18: Flagler Department of Juvenile Justice committee meeting, 9 a.m., Room 3B, third floor of the Government Services Building, Bunnell. Contact: Debbie Neuman, Focus on Flagler Youth Coalition, 386-283-204. The Flagler Palm Coast Amateur Radio Club will meet Saturday 21 Jan 17 @ 9am at the EOC in Bunnell. All are welcome. More information at W4FPC.org. We are a diverse club with interests in emergency communications, VHF/UHF propagation, and community service. For information on Amateur Radio licensing please see the ARRL website at ARRL.org.